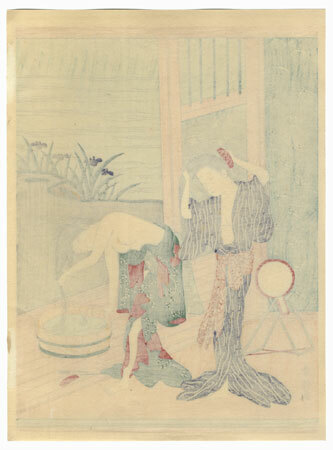 Comments - Lovely Harunobu design of two young beauties in a geisha house washing their hair in a large wooden tub. One combs her long hair as the other bends over the tub, swirling her hair through the water. Purple irises bloom along the water's edge outside. A beautiful subject with fine line work and soft color. An unusually large format Harunobu reprint.